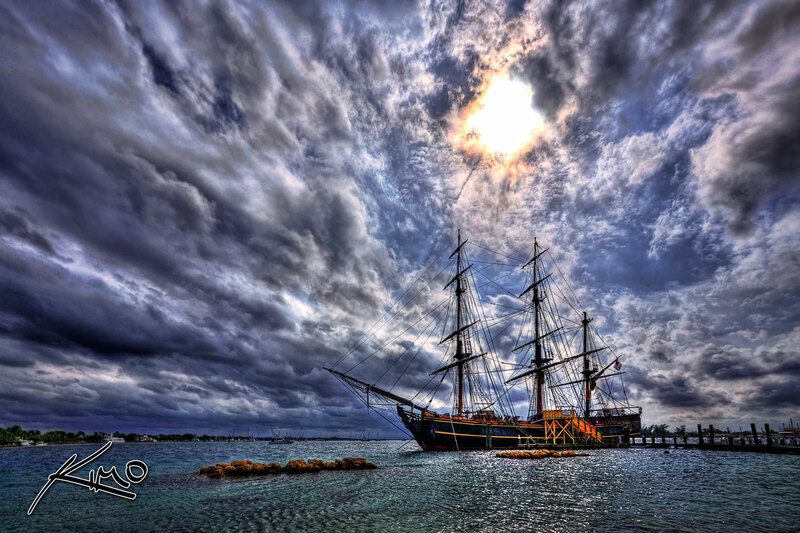 HDR of the Bounty HMS, a replica of the original Bounty HMS ship. The Bounty HMS has a very interesting story behind it which can be read here. The Bounty is currently docked on Peanut Island in West Palm Beach. For 5 bucks a water taxi will drive you to Peanut Island, and for 9 bucks you get a full tour of the ship. It was definitely worth the price of admission to see this magnificent ship. Processing Technique: 3 exposure HDR merged using [intlink id=”546″ type=”post”]Photomatix[/intlink]. Detail enhanced using [intlink id=”542″ type=”post”]Topaz Adjust[/intlink]. Noise removed by [intlink id=”542″ type=”post”]Topaz DeNoise[/intlink]. Image smoothed using [intlink id=”542″ type=”post”]Topaz Simplify[/intlink]. Photo processed with Photoshop CS4.